Dig in that file of yours and find all of the pieces of paper with your child's artwork, notes and stories to make a scrapbook album you will cherish forever! What inspired me to consider making an album displaying my child's artowrk was an event that happened today. 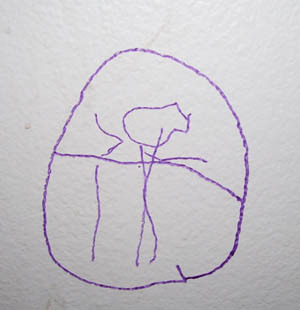 My three-and-a-half-year old son wrote on the wall with a washable marker. (I know, doesn't sound too inspiring, but just keep reading!) My son drew a person inside a circle with cross, like a "No Smoking" sign. The reason for this naught act was that he was trying to get dressed and he did not want his nearly two-year old sister to come into the room. Therefore, he made a "Do Not Enter" sign for her. My husband and I, secretly, though this was quite hilarious, so, when our son was not looking, we took a picture of his drawing (right). I cannot wait to get it developed so that I can create a scrapbook showing his "artwork"
Show of Your Child's Artwork! Have you created a scrapbook page showcasing your child's artwork? If so, share it! What did your child draw?